Special to the Daily/Rick OshloOshlo, pictured in front with the sunglasses, was part of a 19-member team that rode in front of the pros in the USA Pro Cycling Challenge. Including coaches, the entire riding crew was about 25 people. 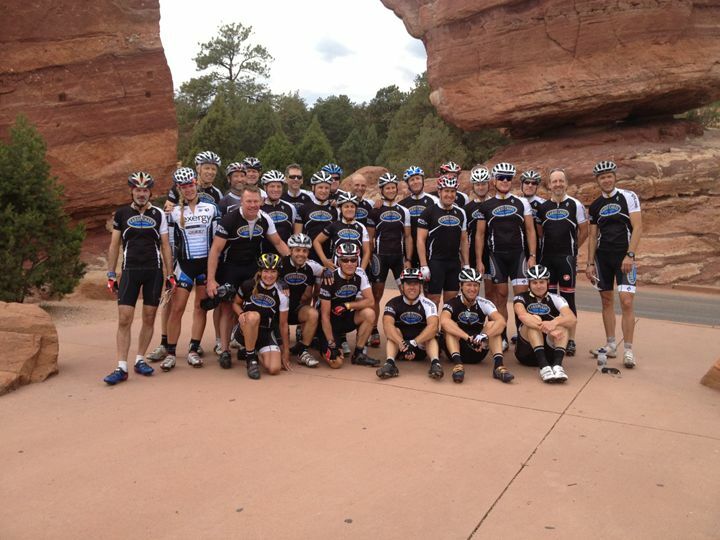 Riding ahead of the pros in the USA Pro Cycling Challenge does one major thing for the 19 doing it. It makes them understand “what it’s like to be a pro stage racer … without being a pro stage racer,” Breckenridge’s 64-year-old Rick Oshlo said. He and 18 other riders had their own coaches, mechanics, massage therapists – the full experience. They also rubbed elbows with the pros during dinners and relaxation at hotel accommodations after each stage. “What distinguishes it from the other tours that are out there … Is the integration into the race, in that we have our own team cars … we go to the team area … we’re staying in the team hotels. We’re eating dinner and staying in the same rooms as everyone else,” said Oshlo, who was a key coordinator for last year’s Breckenridge USA Pro Cycling Challenge finish and who had a similar experience in last year’s Carmichael Training Systems camp at the Amgen Tour of California. Riding ahead of the pros is not a tour, but it’s also not quite a race for the 19 who paid $10,500 and qualified to join the Carmichael Training Systems camp. Riders had to stay ahead of the rolling road closures, but they weren’t in it for a time. Instead, they were in it for the experience. Oshlo told The Denver Post it’s “a privilege denied to many, especially at my age” to ride 600 miles of the 683-mile race and get as close as possible to understanding the life of a stage racer. Though Oshlo completed the course and gained some insight into the world of professional cycling, he admits he doesn’t know the entire story. After all, he drove home after the race. He’ll still train on his bicycle, but he’s not in active recovery after pedaling toward a cash purse. He’s also not headed to another 600-mile or comparable race in September, or October, or November. He will likely stay put, enjoy his bicycle and gear up for the Pro Cycling Challenge next year, if Carmichael Training Systems continues to offer the camp after its inaugural year. On the other hand, many of the pro riders had ridden the Tour de France. Maybe they’d gone from there to the Tour of Utah. After the Pro Cycling Challenge, many might be competing in September’s Vuelta a Espana – the Tour of Spain. It’s difficult, but it’s also thrilling, Oshlo observed. The thrill of the race was particularly evident for his group of riders on Independence Pass and Flagstaff Mountain. “We were getting the bells and the cheers and the ‘go-go-go!’ as much as anyone else,” said Oshlo, who said riding Flagstaff Mountain was among his favorite parts of the experience, beyond even mingling with the pros. Riding the closed streets of Denver an hour before the time trial was his other favorite experience. “You just don’t get that kind of atmosphere when you’re just out riding your bike,” he said. He added that it was exciting to have conversations with elite riders, but the campers were also meant to be part of the crowd rather than an excited observer. Still, he said they interacted with the professional cyclists enough to learn they thought the 19 riders were nuts. Oshlo is proud to say he rode 600 miles of the 683-mile course, but was disappointed to not roll through Breckenridge. He stayed the night in town with the entire caravan, but his 19 riders were shuttled to the other side of Hoosier Pass to begin their ride for the day. There was some concern about potential wind and affected speed in the valley and up Wilkerson Pass – and the peloton wouldn’t be as affected as the smaller group of riders. But it also seems the time trial at the end of the race affected more than the professionals. It allows a mid-race day of rest, so to speak, and it would have been helpful to Oshlo and his fellow riders. By the time they reached Breckenridge, they had completed four days of tough riding. Chris Carmichael felt his riders needed a less intense day at Stage 5. “It was a disappointment to me because it’s my home town,” said Oshlo, who also clarified it was a small disappointment in an overall rewarding experience.